The Indian openers have been in awful form of late. It’s been a tad over a year when batter Shubman Gill made his first-class debut against Bengal in November 2017. Ever since the Fazilka-born cricketer has flourished and has never looked back. He played the U19 World Cup in New Zealand, where he ended up as the second-highest run-scorer with 372 runs from six matches at an average of 124 and a strike-rate of 112.38. He scored three half-centuries and one century against India’s arch-rivals Pakistan in the semi-final. Thereafter, he got a lucrative offer from Kolkata Knight Riders (KKR) to play in this year’s Indian Premier League (IPL). Thereafter, he wielded his magic for Punjab in the Vijay Hazare Trophy and then for India ‘C’ in the Deodhar Trophy where he even smashed a century against India ‘A’. Then he did well in India ‘A’s tour of New Zealand. 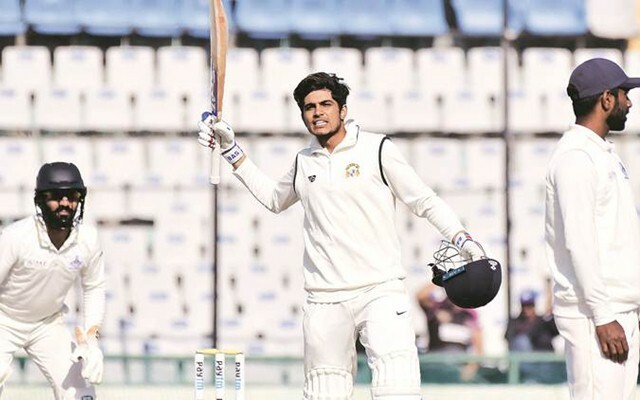 Currently, the 19-year-old is plying his trade for Punjab in the ongoing edition of the Ranji Trophy. In the very first match against Tamil Nadu, he has been able to impress one and all with a masterful double century to his name. After Punjab opted to field first, their bowlers shot the opponents out for a paltry 215 in 85 overs. Shubman came to the party and kept pelting the Tamil Nadu bowlers with sheer ease. At the close of play on Day 2, he was not out on 199 when the on-field umpires decided that the light wasn’t good enough for play to continue. He must have had butterflies in his stomach and would’ve been keen to score the century as soon as he takes the park on the match’s penultimate day. The pugnacious potential didn’t falter and accomplished his maiden double century. In the meantime, Twitter wants Gill in the Indian national team, which is currently playing the second Test against Australia at the new Perth Stadium. The likes of Murali Vijay and KL Rahul have simply been awful and the fans want Gill to be drafted into the Indian side on an immediate basis. Shubman Gill meanwhile 157 (181) not out against TN. Should ideally be our next no.3 or even can take the other opening position, if Rahul continues fails to nail down that position. After watching Mesmerizing performance from Indian openers past 4 tours. I think to make Test Cricket better for India. @imVkohli Hi Virat, I think we have given enough chances to Rahul and Vijay. They disappointed in England and again in the three innings. Don’t you think that the young’s like Manoj Kabra and Subhman Gill must take the bigger stage like Prithvi Shaw!!!!! A die hard cricket fan!!! I Can See Shubman Gill & Prthivi Shaw Opening Together In Test Cricket For India Very Soon..
Pruthvi Shaw and Shubman Gill opening the batting for India in Tests. That day is not far away.